Simply put, the Documentary Hypothesis is an explanation used in Biblical scholarship that helps to explain the difficulties experienced in the Old Testament. Evidence exists in the Old Testament that shows that the first five books in the Bible are not the product of one author, rather it is of composite character. The author/editor of the Book of Mormon used various sources to assemble his work, and he tells his readers that he is doing this. We have a similar type of behavior happening in the construction of the Old Testament, except that the editors/redactors are not telling their readers that this is going on. But they are leaving us clues all over the text for the careful reader to see that this is happening. 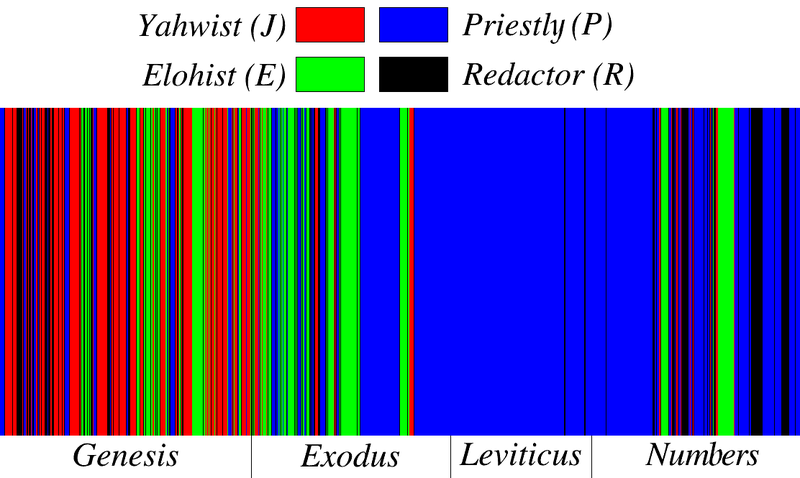 The various names of God: Yahweh, Elohim, El Shaddai, El Elyon, etc. The different authors of these texts had divergent views of God at the times they wrote these accounts – they all experienced God in ways that were unique to them and their culture and worldviews. Repetitions and doublets. I have catalogued 35 stories told twice in the Pentateuch. The Documentary Hypothesis is a tool used to explain why these doublets occur, even down to the subtle (and not so subtle!) differences in these stories, explaining why we read such changes. Inconsistencies regarding laws – for example, there are 3 divergent slave laws in the books of Exodus, Leviticus, and Deuteronomy, all supposedly coming to us from the pen of Moses. These authors even disagree as to how old God says that mankind can live, with one author stating that there is a 120 year maximum age limit, while a different author portrays prophets living much longer than 12o years. Stylistic differences: once readers are aware of the different authors that have penned these texts, they can see stylistic differences readily. For example, the rule keeping Priestly author sounds much different to modern readers than the Jahwist. The narration of the story of Moses sounds much different than Exodus 36-40 where the Priestly author delves into the intricacies of the functions of the priesthood and the tabernacle. The author of Deuteronomy views the temple as a place where God will put his name, while the Priestly author sees the temple/tabernacle as a place where God dwells. Breaks in the text: when readers are notified to the breaks in the texts they can see where one author left off and when he picks the story up again from the previous break in the narrative. I will write more about breaks in the text in future posts, but for now, one of my favorite breaks in the text happens in Numbers 20:29. In this verse we learn that Aaron dies and that the people “mourned for thirty days, even all the house of Israel.” The text then goes on to tell other stories: the brass serpent in Numbers 21, and the Balaam/Balak episode in Numbers 22-24, both stories from a northern author – the Elohist. Then in Numbers 25 we pick up again with the Priestly author who informs readers that “behold, one of the children of Israel came and brought unto his brethren a Midianitish woman in the sight of Moses, and in the sight of all the congregation of the children of Israel, who were weeping before the door of the tabernacle of the congregation” (Numbers 25:6). Why are they mourning? The last verse of P before this was Numbers 20:29, and so after a four chapter break, P continues where it had left off, and we have the people mourning the death of Aaron from Numbers 20:29. I highly recommend reading Richard Friedmans defense of the Documentary Hypothesis for a great introduction regarding the strength of the Documentary Hypothesis and its explanatory power. This entry was posted in Messiness of scripture, Old Testament and tagged Biblical Scholarship, Documentary Hypothesis, Old Testament, The Documentary Hypothesis. Bookmark the permalink.